1-Part, high-gloss polyurethane topside paint that flows easily and cures properly in cooler conditions—down to 45°F. Advanced UV stabilizers ensure a long-lasting finish with excellent color retention, chemical resistance, and abrasion resistance. This easy-to-apply paint is available in our 6 most popular Wet Edge colors. Ever wish you could get your topsides painted in colder weather? We do, so we developed Wet Edge Cold Cure Topside Paint to see just how low we could go. At 45°F, Wet Edge Cold Cure loads up smoothly on the brush or roller, flows easily, forms a consistent film, dries evenly, and cures to a hard but flexible finish. Try doing that with a conventional 1-part marine topside paint and you get improper mixing, bad flow, slow cure, inconsistent color, and a viscosity that mimics intertidal mud. Not a pretty picture. Wet Edge Cold Cure can be applied easily to properly prepared fiberglass, wood, metals, and previously painted surfaces by brush, roller, or spray gun. And there’s no need for fancy spray equipment to get a gorgeous, professional-spray-job-looking finish—just roll & tip, taking care to brush from the wet edge into new paint. 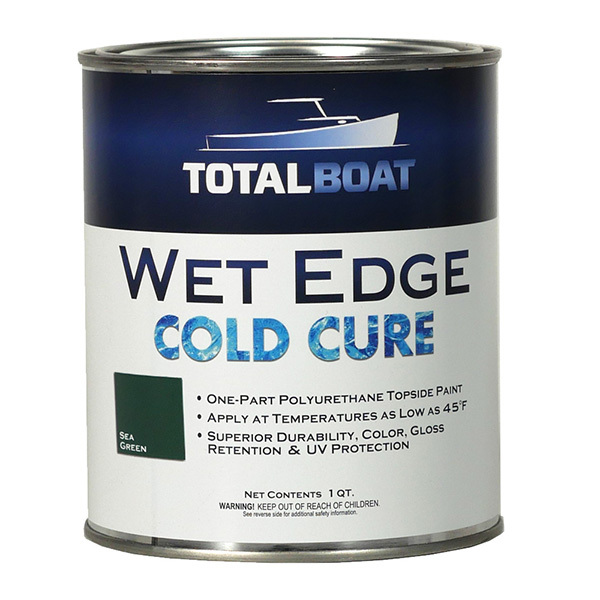 Like our regular Wet Edge paint, this advanced Cold Cure formula has a high solids content so you need to apply it in thin coats so it’ll dry properly, especially in cooler conditions. For best color and finish, all it takes is 2-3 thin coats. For the easiest application and desired results in temperatures above 70°F, use our regular Wet Edge topside paint. Below 70°F, use Wet Edge Cold Cure, because even though its solvent content and viscosity have been adjusted for optimal flow and self-leveling in colder conditions, you still get the same high gloss, color retention, UV protection, and durability as regular Wet Edge. Cold Cure gives you cold weather painting confidence in a can, so you can stop wishing, start applying, and splash sooner. 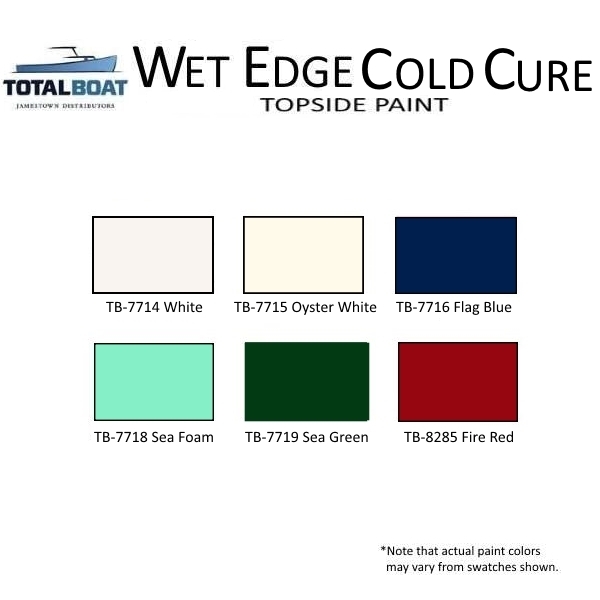 WARNING: Wet Edge Cold Cure is not recommended as a quick-drying solution in temperatures above 70°F because its flow properties and other characteristics are not similar to our regular Wet Edge topside paint. For easiest application and desired results in temperatures above 70°F, use regular Wet Edge.